Accelerated Life Testing (also known as ALT) is the process of testing a product or a component by subjecting it to extreme conditions beyond the normal requirements in order to identify the potential failure modes and the withstanding limit of the product in a short span of time. Example: A cell phone manufacturer conducts the following tests to ensure that the product quality is as per the customer requirements. Drop Testing: Dropping the phone from different heights and also dropping different objects on the phone’s surface. Dust exposure: Checking whether the call quality is the same after being exposed to heavy dust. In order to understand the concept of Accelerated Life Testing, one needs to understand the concept of Reliability, Mean Time between Failures and Life Testing. Reliability is the probability that a product will perform the intended function under specified conditions. For example, ‘Reliability of Software’ is expressed as the percentage of times the software delivers desired output when tested ‘n’ number of times. ‘Mean Time between Failures’ (MTBF) is the average time in between subsequent failures. It is one of the ways of expressing how reliable a given product or component is. 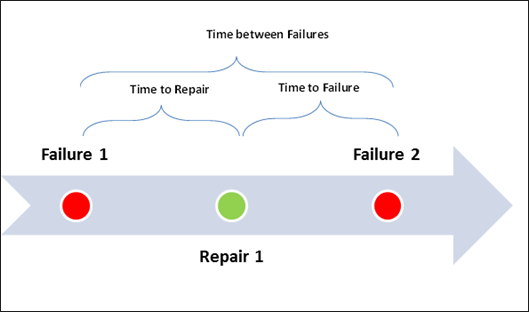 The below is an illustration of how time between failures is calculated. Life Testing is the process of Testing a Product or a Component under stated conditions, to identify how and when the product or component will fail. It is the process of identifying the failure modes and the withstanding capability/limit of the product or component. Life Testing helps us understand and improve the Reliability of a product. It also establishes the strongest and weakest limits of the product. Life Testing and Accelerated Life Testing are methods used to test the reliability of a product in a New Product Development during Design Phase, before the product is released to market. Traditionally Life testing was used to analyze the time to failure under normal conditions. For a particular component, if the time taken to fail is quite long, then the testing time, analyzing time, redesigning time of a product and subsequently the time taken for the product release in market will be delayed. In a world of constantly changing customer requirements and technological advancements, such a product might not catch the eye of the customer due to competitive products being released or the launch of any other product with advanced technology. Hence it is important that Product development teams have to reduce the cycle time. Accelerated Life Testing thus holds a very important place in reducing the time taken for testing of the products. Accelerated Testing has a set of predefined procedures or instructions that are followed to test the product. The product is subjected to prolonged stress or extreme stress conditions to identify the failure modes and limits. Stress Conditions could be: Variation in Temperature, Pressure, Vibrations, Voltage and so on. The results of the tests are collected, documented and sent for analysis. Based on the outcome of analysis, the product is redesigned or modified as per customer expectations. Quantify the characteristics: Having identified the failure modes, the tolerance limits (weakest and strongest limits) of the object are established. Accelerated Life Testing methods could be very costly and hence, should be carried out with less iterations. It is advisable to first identify the failure modes with Qualitative testing, and then proceed to Quantitative Testing only to those vital failure modes. This way, cost of testing can be reduced. Usage Rate Acceleration: This method is otherwise known as Compressed Time Acceleration. As the name implies, the time taken to failure is advanced, by prolonged use of the product. All other stress levels are maintained at normal usage level. For example, a washing machine is put to use continuously till the time it fails. Over Stress Acceleration: The stress level that is much higher than normal operating condition is used. Example: Cell phones chargers being subject to extremely high voltage supply. It enables the user to find the life of a Product or component. This is useful for marketing a product and also predict the demand for the product in future (otherwise the Repurchase volume). Constant monitoring of the Accelerated Life Testing results helps to improve the Design Quality of New Product Development cycle. Knowing the Reliability and MTBF of a product, helps the user to calculate warranty cost and plan for the same.